At the Stache Pag (Mainer for “Moustache Pageant”), mustachioed men (and facial hair-clad women!) 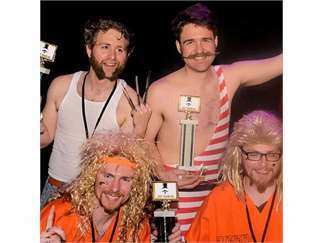 perform for your adulation while competing for the title of Mr. Stache Pag. Each contestant, in numerical order, will strut his stuff on the catwalk while the host announces his name and a few observations. Each mustachio gets five seconds and some funky music to work with, and work it they will. At the close of the first round, the competition will move into the talent portion of the program. The Castaway – Best Full Beard.